A critical moment in NASA’S Juno mission has been postponed while engineers at the Jet Propulsion Laboratory attempt to sort out a mysterious engine issue. 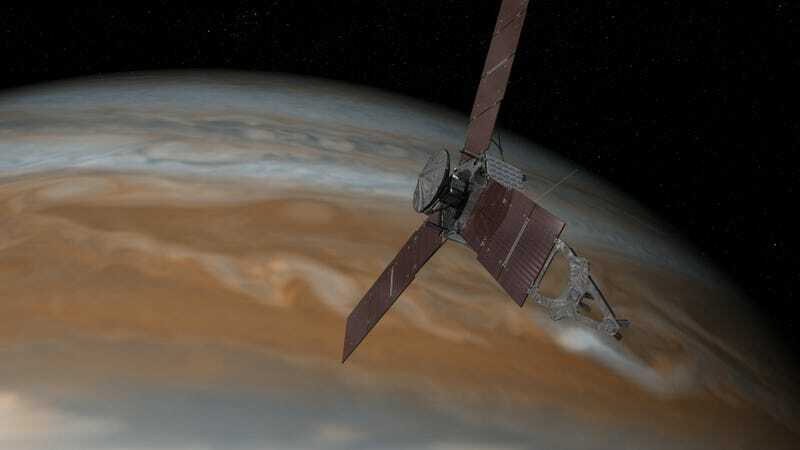 If the problem is not resolved quickly, it could reduce the amount of high-quality data the Jupiter-orbiting probe is able to collect during its scientific mission. On October 19th, at its point of closest approach to Jupiter (called periapsis), the Juno spacecraft was scheduled to perform its final main engine burn, a “period reduction maneuver” that would narrow its orbit from 53.4 days to 2 weeks. Once in its “science orbit,” the spacecraft’s main data collection phase will commence. Delaying the burn means delaying the start of Juno’s science mission, which entails collecting a slew of data and images during 36 close-in orbits. The spacecraft’s next window to enter science orbit falls on December 11th. If the December 11th periapsis is also missed, it could become harder for Juno to execute all 36 flybys perfectly, owing to the slow degradation of its scientific instruments in Jupiter’s intense radiation environment. But the mission scientists won’t just be sitting tight while engineers sort out this valve issue. In fact, Juno will be collecting more scientific data during its October 19th planetary pass than originally anticipated, because NASA won’t be shutting off any instruments for an engine burn. “The data we collected during our first flyby on August 27th was a revelation, and I fully anticipate a similar result from Juno’s October 19th flyby,” Juno principal investigator Scott Bolton said. Gizmodo has reached out to NASA for more information on the nature of the problem, and we’ll update if we hear anything interesting.